Featuring up to 72 wire-speed 1GbE or 10GbE small form-factor pluggable and pluggable plus transceiver (SFP/SFP+) ports, and up to 12 wire-speed 40GbE quad SFP+ transceiver (QSFP+) ports in a compact one rack unit (1 U) platform, the Juniper Networks® EX4600 Ethernet Switch delivers 1.44 Tbps of Layer 2 and Layer 3 connectivity to networked devices such as secure routers, servers, and other switches. 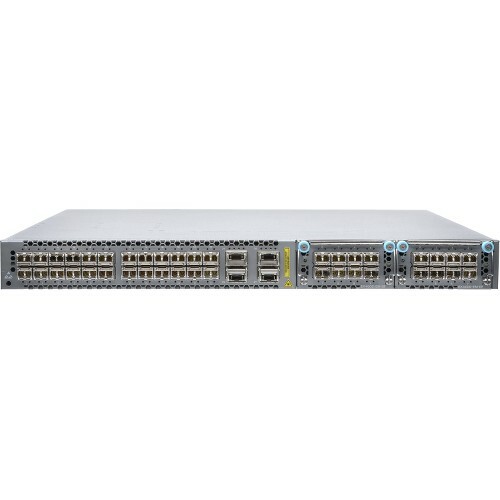 The EX4600 base switch provides 24 fixed 10GbE SFP/SFP+ ports and 4 fixed 40GbE QSFP+ ports. A total of four models are available: two featuring AC power supplies and front-to back or back-to-front airflow; and two featuring DC power supplies and front-to-back or back-to-front airflow.